fits three 2200mah 3S1P packs comfortably. Designed specifically for the Walkera QR Ladybird/Genius CP/Mini CP. A direct replacement for W..
More than just a fancy name. TURNIGY nano-tech lithium polymer batteries are built with an..
More than just a fancy name. TURNIGY nano-tech lithium polymer batteries are built with an LiCo &nbs.. Finally, a nano-tech has arrived for your Solo-Pro 180 helicopter. Boost the performance o..
A true 35C A-Grade battery.Dont be fooled by Chinese vendors selling 20C packs as 30C or more.This i.. Designed specifically for the Turnigy FBL100 and E-Flight Blade mCPx. A direct replacement for EFLB2..
Zippy Compact, the latest addition to our Zippy battery series offers excellent performance and high..
RC Turnigy nano-tech 1300mAh 3S 45~90C Lipo Pack. The new number one in performance and price!The new Turnigy Lipoly packs deliver full capacity at th.. Though uncommon, lipo fires are a reality and a danger. 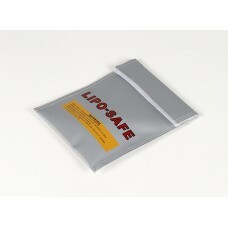 Lipo batteries should always be ch..
RC Lipoly Safety Charge Bag 14 x 23 cm, Fire Resistant. UK Stock. Although uncommon, lipoly fires are a reality and a danger. Lipo batteries should always b..